Peanuts aren’t actually nuts, but they do have the heart benefits that nuts have, with some bonus value. Peanuts are most closely related to beans and lentils. They may even make you healthier, leaner, and smarter over a lifetime. Interestingly enough, it may be the peanut itself that prevents peanut allergies from developing. Peanuts are higher in protein than nuts. There are almost 10 grams of protein in 1/4 cup (36.5g). That’s a lot of good plant-based protein that we can use to avoid disease. Also, we need to eat more protein, spread throughout the day, to offset the age-related muscle loss that begins around age 30. Try to eat at least 75 grams of protein per day. This helps keep us from losing muscle by providing us with a store of protein building blocks that are ready to make more muscle as we move and exercise. This pool of amino acids (broken down from the protein we eat) only last for about three hours, which is why it is so important to eat protein throughout the day. People who get more of their protein from plant sources have an overall lower risk of dying early than those who consume a lot of animal protein, especially processed meats and red meat. Besides being an excellent source of protein, peanuts are also loaded with nutrients. Some may even surprise you. Peanuts are a great source of biotin, copper, manganese, niacin, molybdenum, folate, vitamin E, phosphorus, vitamin B1, and fiber. Peanuts contain many phytonutrients too, including the powerful and well-known one found in red wine and grapes – resveratrol. This special nutrient is heart-protective and cancer-preventative. Next to grape skins, peanuts are one of the richest sources of resveratrol. As with tree nuts, eating peanuts regularly lowers your risk of heart disease and helps control your weight. Four large studies were combined to show that those who were eating nuts, including peanuts and peanut butter, at least four times per week showed a 37% reduced risk of heart disease. Despite being well known for their heart-protective qualities, people tend to avoid nuts and peanuts because they are high in calories. Those who eat nuts at least twice a week are much less likely to gain weight than those who almost never eat nuts. But we’re so conditioned to worry about calories instead of the type of calories in food that we miss the fat burning qualities of certain types of foods. The primary source of fat in peanuts, as well as in most tree nuts, is monounsaturated fats. Research indicates that substituting monounsaturated fats for saturated fats in your diet helps you lose belly fat. Concentrate on eating whole food, packaged by mother nature, rather than the number of calories in your food. You will be happier and healthier! Eating peanuts may make you smarter, too. Niacin-rich foods like peanuts may provide protection against Alzheimer’s disease and age-related cognitive decline if consumed regularly. Research published in the Journal of Neurology, Neurosurgery and Psychiatry reported that out of 3,000 participants, those eating about 22 mg/day of niacin from foods were 70% less likely to have developed Alzheimer’s disease than those consuming the least (about 13 mg/day). A handful of peanuts (1/4 cup) provides almost 6 mg of niacin. 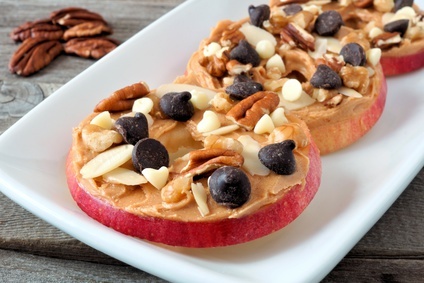 Pair with a fruit or vegetable for a perfect snack. 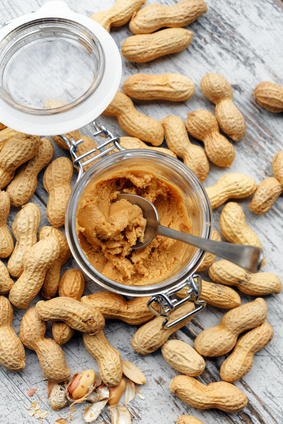 Peanut allergies have doubled in the last ten years. No one knows why but interestingly enough, studies are now finding that avoiding peanuts during pregnancy doesn’t reduce peanut allergies in infants, and that infants fed peanut products earlier seem to have fewer peanut allergies. So unless children have been diagnosed with a peanut allergy, peanuts may be beneficial in avoiding an allergy. 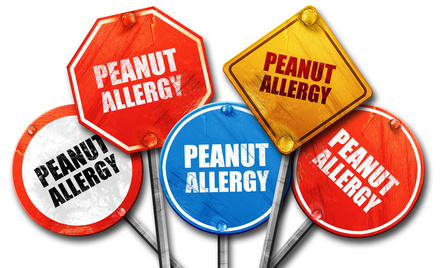 Of course, peanut allergies are potentially life-threatening, so it’s critical not to add peanuts to food if you don’t know for certain they don’t have a peanut allergy. 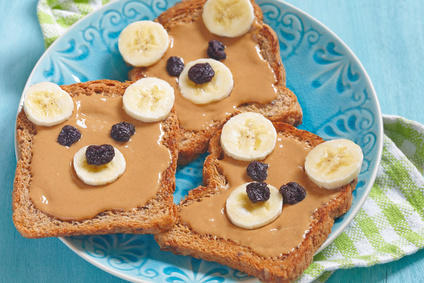 Buy organic peanut butter without the sugar, added oil, and emulsifiers. So many people feel like they have to buy the big name-brand peanut butter or no one will like it. But fresher peanut butter doesn’t separate out into layers like the old-fashioned natural peanut butter. There are plenty of peanut butters available now that don’t separate, without adding the unhealthy ingredients. Peanut butter has come a long way. If you have to add sweetness, mix in some real maple syrup, but over time decrease the amount to get everyone one eating peanut butter with some added salt only. I love supermarkets that sell freshly ground peanut butter. No peanut butter separation issues there. The bottom-line is that peanuts are a whole food, full of thousands of nutrients that work synergistically to protect us from disease, and they can even help us lose body fat. Unless you have a peanut allergy, choose nuts over pretzels or cookies on your next plane flight. Ideally, buy them raw or dry roasted. Peanuts in their shell are the perfect snack. It takes time to shell them and slows you down, they’re inexpensive (especially compared to tree nuts), and they taste great. 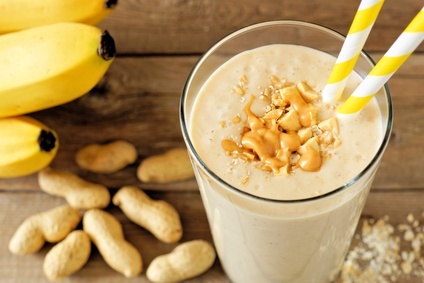 Take August’s Healthy Challenge and eat peanuts for a tastier today and a healthier tomorrow. Every month I choose a health-boosting food or tip to focus on. Join the fun and try my Healthy Challenge for the month too! Farro is an ancient grain belonging to the wheat family. It gave rise to durum wheat, from which pasta flour is made, and spelt, but was replaced in modern times by ordinary wheat because modern-day wheat is easier to harvest and has a higher crop yield. Yet farro has twice the fiber (5 g/serving) and protein (7 g/serving) of modern wheat. It's also high in minerals: iron, magnesium, selenium, and zinc, as well as B vitamins and vitamin E.
It is time to make your goals stick, so they positively affect your life rather than make you feel like a failure! I’m challenging you this month to replace processed sugar and sweet treats with fruit! Many people equate fruit with white sugar, claiming it to be just as bad. THIS ISN'T TRUE! I'm regularly told, "I'm skipping fruit and sugar as part of my diet plan," as if it's the same thing. If you are someone who thinks this, please keep reading! Copyright 2010 - 2019 | Designed and developed by katcheCode.